Wood frogs such as this one pictured in Westborough, need vernal pools to breed. Editor's Note: Starting with this week's issue, Annie Reid and Garry Kessler will write a bi-monthly column for the News on behalf of the Westborough Community Land Trust . If you walk in the woods in late March or early April and happen to pass near some wet areas, you might hear a loud quacking. Ducks in the woods? No, you're probably hearing wood frogs (Rana sylvatica) announcing their breeding place and season. If you follow the sound and happen to spot a wood frog, note the dark raccoon-like mask around the eyes. These hearty frogs spend the winter partly frozen, buried in mud and dead leaves. Wood frogs survive thanks to a kind of antifreeze that their bodies produce as soon as ice begins to form on their skin. In early spring they emerge and make their way to the vernal pools that dot the New England woodlands. They hop right in, even when chunks of ice still float on the water. Vernal pools, or spring pools, are landlocked pockets of standing water that appear in low places in the woods in winter and spring and then gradually dry up throughout the summer until they're gone. While they last, vernal pools are wonderful breeding places for a treasure trove of creatures--certain insects, frogs, and salamanders--whose young mature in the vanishing waters. Because they dry up, vernal pools usually don't have fish, which would feed on the eggs, tadpoles, and other larvae. 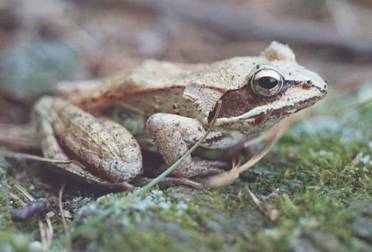 Wood frogs are one of the animals that need these special places to breed.